NintendoCasemods.com - Make your own jewel! skills - You don't need to be a rocket scientist to be able to make this mod. However you do need some basic modding skills. Most important one is that you have a steady hand that knows how to handle a Dremel. Also some basic soldering skills are preferable. If you have that, it's unlikely that you'll screw up. time - It doesn't either take a lot of time to make the mod. Depending on your skills, it is very well possible that you finish the project within one day! 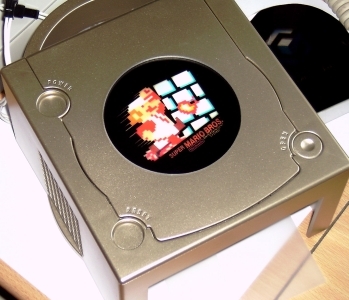 tools - You'll need a special screwdriver (or bit-piece) to be able to open up the Gamecube. This is known as the 'gamebit', and can be purchased at various places on the web. Other needed tools are a dremel with grinding discs, a soldering iron and a standard drill. The rest is all stuff that most people probably already have laying around somewhere. materials - This is a hard one. 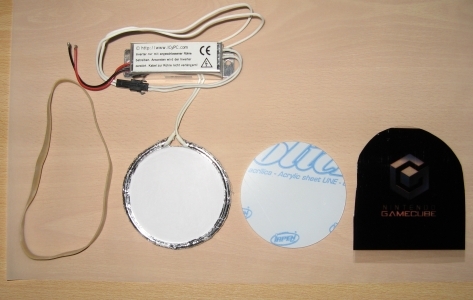 You'll need a to get your hands on a white CCFL-ring and two carefully sized plexiglas circles. Luckily I can help out. I do have a lot of stuff left over that might be of use to other people. Actually I do have enough lasercut plexiglas discs, ccfl-rings, rubber bands and tracing paper to make starter-kits for over 10 people! So if you are interested... contact me, a kit costs about 15 euros. While I'm at it I might as well also send you along a printed logo. Instructions - Of course once you have all the stuff you need, you want to know what to do with it. I don't yet have a detailed set of instructions on how you need to make the mod. I simply don't know if anyone is interested in making it so I won't make one unless I know some people want me to. Therefore I'd be more than happy to personally help you out on your quest! Just contact me. Good luck on making your mod!